In a large bowl, soak the corn husks in hot tap water until pliable, about 1 hour. Meanwhile, in a medium heatproof bowl, whisk the masa harina with 1 tablespoon of the sugar, the baking powder and 2 1/2 teaspoons of salt. In a medium microwave-safe bowl, warm the milk at high power for 30 seconds, until steaming. Pour the warm milk over the masa and stir until just combined. Let cool at room temperature for 10 minutes. In a food processor, pulse the corn until a chunky puree forms. Using a rubber spatula, scrape the corn puree into the bowl with the cooled masa mixture and stir until combined. In a large bowl, using a hand mixer, beat the butter with the remaining 4 tablespoons of sugar at medium speed until light and fluffy, about 2 minutes. At medium-low speed, add the cooled masa mixture in four additions, beating well after each addition. Fill the bottom of the steamer with 2 inches of water. Place the steamer insert over the base. Place the remaining corn husks on top of the assembled tamales and cover the insert with a lid. Bring the water to a boil. Reduce the heat to moderately low and steam the tamales for 1 1/2 hours. Using tongs, transfer one tamale to a work surface. Carefully open the husk. If the husk peels away without much sticking, the tamale is cooked. If not, cover the pot again and check the tamales every 10 minutes until the filling no longer sticks to the husk. Uncover and let cool for 15 minutes before serving. 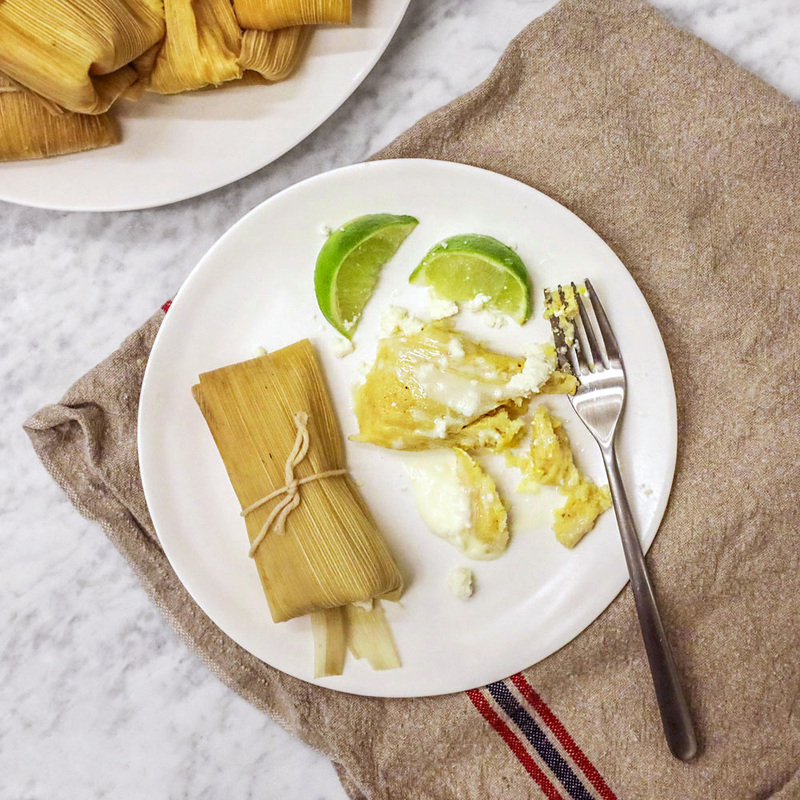 Serve the tamales warm with crema, crumbled queso fresco and lime wedges. The tamales can be made through Step 5 and refrigerated for up to 2 days. Or freeze for up to 1 month. Freeze them first on a rimmed baking sheet, then transfer to an airtight container to store. Thaw in the refrigerator before proceeding with the recipe.